We notice fennel is making a welcome appearance once again on the market stalls in North End Road. 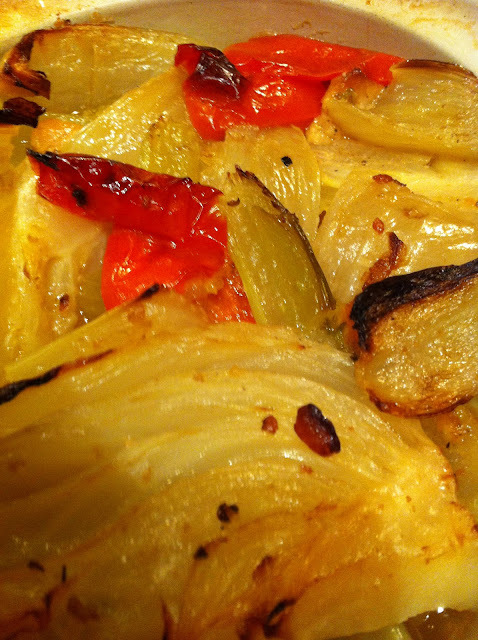 Are you a fennel fan? We are. It has a unique taste and is widely used in cuisines from Southern Europe, where it is native, across Asia Minor to the Indian subcontinent where it is an important ingredient in Khasmiri, Pandit and Gujarati cooking. Further east the seeds with their distinctive aniseed flavour are key in Chinese 5 spice powder. In Greek mythology Prometheus used a fennel stalk to steal fire from Zeus and give it to the mortals with disastrous consequences. He was punished by being tied to a rock where an eagle would eat out his liver every day only for it to grow back in time for the following day's gory fest. But let's get back to fennel. The familiar bulbs we cook with are known as Florence Fennel which is a cultivar, that is it has been especially bred for its desirable qualities. One thing to watch out for though, particularly in larger and more mature plants is that bulbs can be stringy. The recipe below calls for over an hours braising in a hot oven which should be sufficient to soften even the toughest bulbs. We suggest teaming this delicious vegetable with celery hearts and parmesan but you can also make a meaty version by adding strips of pork or chicken into the dish. It is also a classic accompaniment for fish such as sea bass or sea bream which should be cooked separately. Prepare the vegetables by cutting off the fennel stalk tops and chopping them. Likewise cut the leaves and tops off the celery and chop. Chop the pepper. Quarter the fennel bulbs, halve the celery hearts lengthwise. Melt a little butter in a casserole dish and add 1 tbsp olive oil. Place all the vegetables in the dish and pour in the stock, white wine and parmesan. Season, cover with damp and crinkled grease proof paper known as a cartouche and the vessel lid and place in a pre-heated oven for 40 mins. Cook for a further 30 mins with the lid and cartouche off. Once you are happy the fennel is well cooked spoon off some of the liquid to a separate bowl containing the creme fraiche and then put back into the main dish. This will help prevent the cream from splitting. Serve with steamed new potatoes.